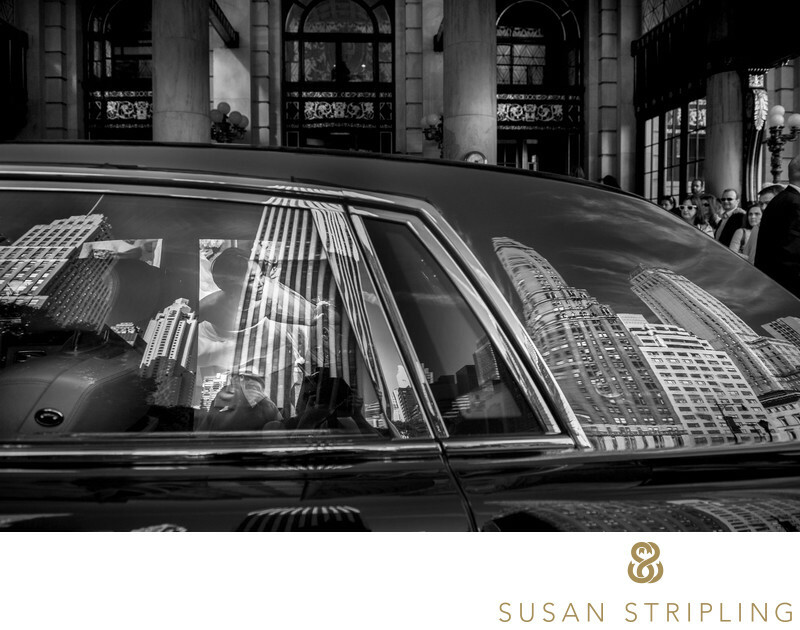 When you think of luxury in Manhattan you think of the Plaza. The end. 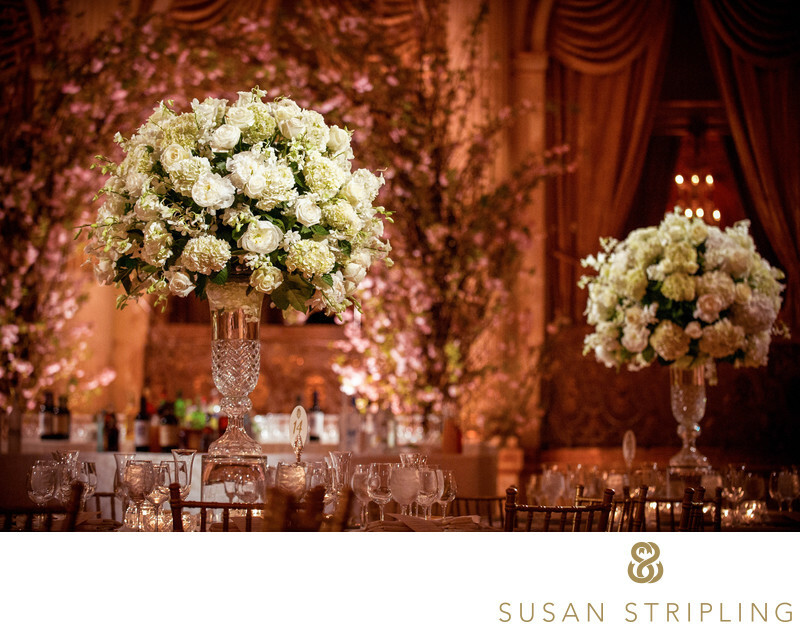 This iconic wedding venue in the heart of New York City is the epitome of class, grace, and grandeur. This iconic New York wedding venue derives its’ name from its’ location at the corner of Grand Army Plaza, right at the junction of Central Park South and Manhattan’s iconic Fifth Avenue. In 1969, the Plaza was given status as a landmark by the New York City Landmarks Preservation Commission. In 1986, it was named as a National Historic Landmark. From the Palm Court’s stained glass ceilings to the delicacy of the Champagne bar, the Terrace Room to the Edwardian Room, the Plaza is the epitome of class and luxury. The Plaza Hotel has long been a wedding venue for Manhattan socialites and celebrities alike. Michael Douglas and Catherine Zeta-Jones said "I do" at this Manhattan wedding hot spot. Eddie Murphy and Nicole Mitchell were married at the Plaza Hotel. 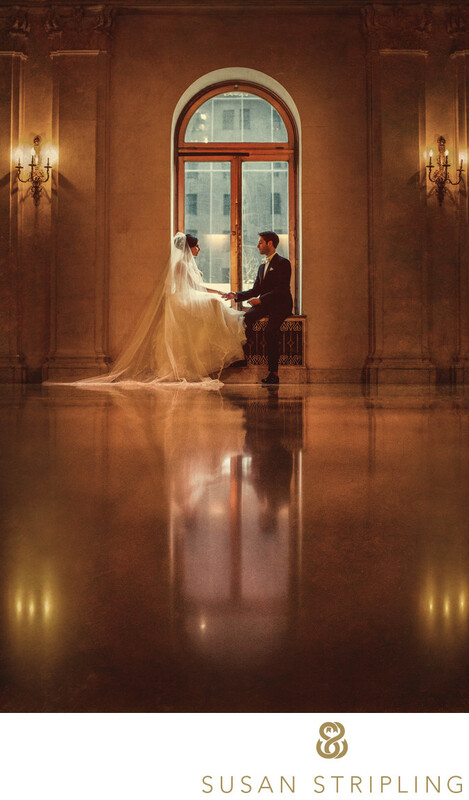 With its superb white glove service and extraordinary surroundings, it is no wonder that the Plaza Hotel is a favorite wedding spot for everyone! If you want to take your wedding day photographs at the Plaza Hotel, you are in luck only if you are getting married there! This hotel is famous for valuing the privacy of its guests. For that reason, wedding photography is prohibited in all public spaces of the hotel. If you are getting married at the Plaza Hotel, there is a little bit more flexibility. You still are not allowed to take your wedding day photographs in public spaces, but you will have access to your hotel rooms and the ballrooms as well. You can take your first look photographs on the grand staircase, and the staff of the Plaza Hotel will go above and beyond to make sure this is an incredible experience for you. If you would like to step outside for your wedding day photographs, the Plaza Hotel is right on the corner of Central Park! It truly is fantastic to be able to go to the iconic park, and create wedding day portraits that match the iconic nature of the wedding venue. Whether we are able to spend five minutes in the park with the wedding couple, or more time with the family and bridal party, a visit to Central Park is a must for any Plaza Hotel wedding. If you are having your wedding ceremony and reception at the Plaza Hotel and would like to go to Central Park for your portraits, let's chat! I would be more than glad to help you work on your wedding day timeline to ensure that we are able to take portraits in all of the locations that you desire. 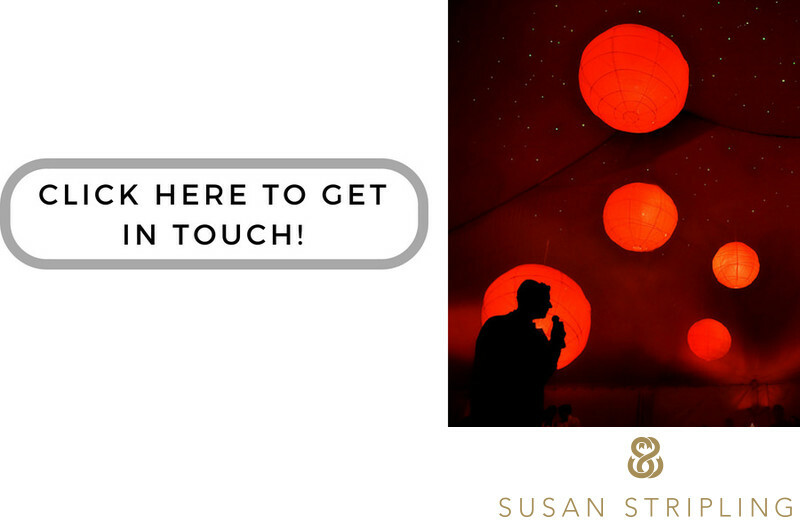 I have been helping brides and grooms create wedding day timelines for over fifteen years, and it is a service that I am always thrilled to provide to my wedding clients. I love photographing weddings at this sumptuous hotel. The suites are superb, the lighting is lovely, and there are many, many locations to create exquisite portraits. At this 2014 winter Plaza Hotel wedding the bride and groom braved the cold for some portraits, but we ended up inside to finish out their portrait session. I absolutely adore this image of them simply sitting in this window. I got as close to the ground as I possibly could so that I could capture the reflection in the floor as clearly as I was able. I love the mirrored image in the floor. I love the gorgeous lighting coming from the window and how it matches the warmth of the Plaza walls. Most of all I love the sweetly natural interaction between the bride and groom. Without that the portrait would not be as impactful! As a wedding photographer, the hallmark of my style is documentary coverage. This also can be known as wedding photojournalism. This means that I allow moments to unfold naturally on the wedding day, not stopping and restarting moments for photographs. I have many prospective brides and grooms asked me how a documentary wedding photographer approaches the portrait session on the wedding day. This is a great question! I believe that this image exemplifies the type of documentary portrait coverage that I create at every wedding that I photograph. It is beautiful, yet casual. Elegant, yet believable. So how is it done in real time, on a real wedding day? The first thing I do is find a great situation for a portrait. I look for beautiful light first and foremost. Then I look for a proper background. 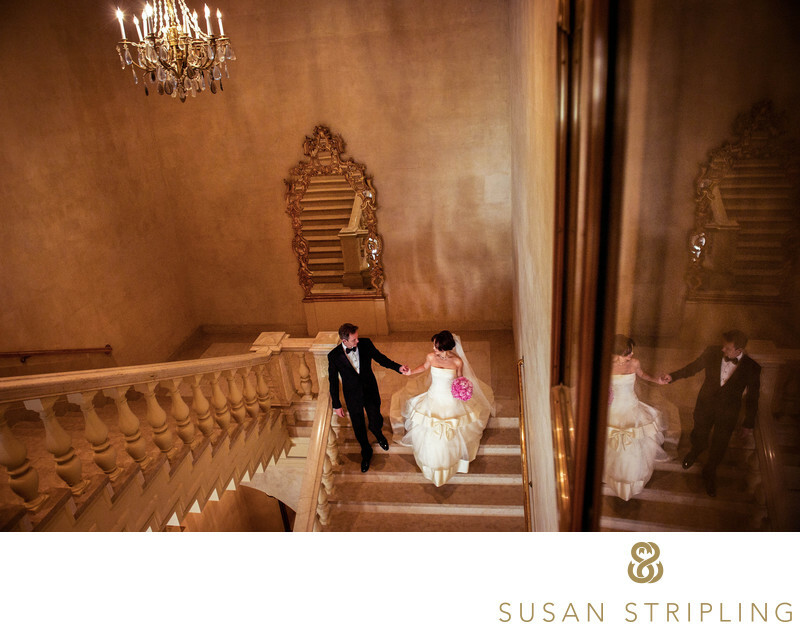 In the instance of this wedding day photograph, the light is coming from the very large window located just at the bottom of the grand staircase at the Plaza Hotel in New York City. The background is the windowsill, which was a wonderful location for the bride and groom to sit on. I've then instructed the wedding couple to simply interact with each other! The goal here is to allow the bride and groom to simply be themselves. I find the less I pose and prompt my couples, the more natural are in their photographs. I want my clients to look back on their wedding day portraits and feel that the images truly reflect who they are as a couple. I don't like to lead my brides and grooms through convoluted poses, as they often do not reflect the way they actually act and interact with each other! If I can create a sense of trust between myself and my wedding clients, it is much easier for them to be themselves in front of me. It is for this reason I strive to build a wonderful relationship with my wedding clients from the very first email or phone call. If you would like to hear more about how I approach the portrait session on Wednesday, please drop me an email or give me a call. I would love to hear about your plans and describe my style to you! Location: 768 5th Ave, New York, NY 10019. Keywords: New York City (207), The Plaza Hotel (57). 1/160; f/2.0; ISO 3600; 35.0 mm.